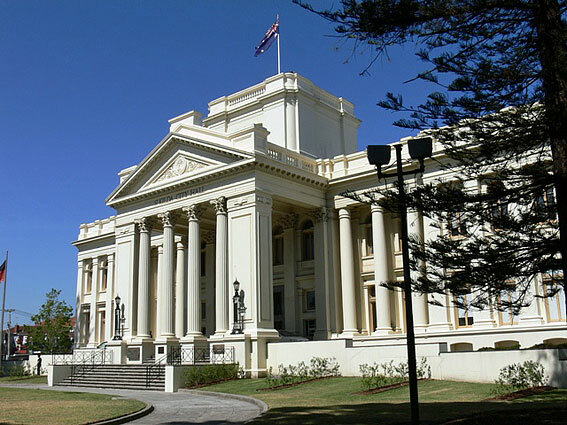 On 11 May 1987 during the Melbourne International Festival of Organ & Harpsichord a concert was given in St Kilda Town Hall featuring two organists. Michael Dudman played the first half concluding with Prelude & Toccata by Theodore Dubois. The second half was given by theatre organist David Johnston. 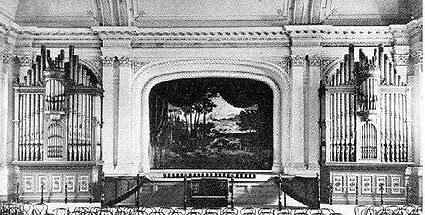 Members of OHTA will be saddened to learn that the 1892 Fincham & Hobday grand organ in St Kilda Town Hall was totally destroyed in a tragic fire which consumed the concert hall early in the morning of Sunday 7 April. This instrument was the sole surviving 19th century concert organ in Victoria, the sole surviving Fincham concert organ, and the only permanent concert organ to be installed by a suburban municipality throughout Australia during the 19th century. While the organ had been rebuilt in 1961 by George Fincham & Sons, most of the original pipework, of outstanding tonal quality, survived intact. The rebuilding saw the introduction of a new mobile all-electric console and electro-pneumatic action, and the original cases were removed at this time in favour of pipeless screens, although fragments of the 1892 cases still survive at the Fincham factory in Richmond. Fincham's tonal design of 1892 was masterly. The Great Organ was complete from 16ft open double to a five-rank quint mixture and fiery Posaune. The Swell Organ was unusually comprehensive, with a complete flue chorus to three-rank Sesquialtera and four magrificent reeds. The enclosed Choir Organ included strings, harmonic flutes and three imitative reeds. The Pedal Organ included two open 16ft flues but the reed was only prepared for. The original divided cases were painted in shades of green and gold and the facade pipes were elaborately diapered, the whole presenting a stunning sight. The OHTA chairman can well remember seeing the unaltered instrument at the age of eight and being highly impressed! The loss of this instrument is particularly sad as it was such a fine example of 19th century organbuilding at its best, with vigorous, warm and brilliant flue choruses, flutes of great liquidity and astounding open shallot chorus reeds which could well be compared with those of Cavaille-coll. While the instrument had suffered from serious visual degradation, and seriously in need of cleaning, there had always been the hope of the 1892 cases being reinstated. Pedal organ compass CCC to F, 30 notes. 38 Swell to great organ. 39 Swell to pedal organ. 40 Great to pedal organ. 41 Choir to pedal organ. 42 Swell to choir organ. Crescendo movement to choir and solo. Four to choir and solo. The total number of stops is 48, and the total number of pipes 2,276, and it is worthy of mention that every item in the details, including the pipe metal, is made in the colony. A special mention is deserved of the connection between the key-board and the pipes. The former is on the floor of the hall, up against the front of the stage, and the connections are made on the tubular-pneumatic principle. From the underside of each key runs a metal tube a little larger than a lead pencil, terminating at the corresponding pipe or pipes. By the simple, yet ingenious system of valves, that pressure on a key, by the impetus of the compressed air with which the tubes are filled, opens the pipe instantaneously, and as the finger is lifted, the pipe closes as quickly... Between three and four miles of the tubes (which are of composite metal specially made for the firm in the colony) are used for these connections of keys and stops with the pipes. The wind is supplied by an enormous bellows in the basement, worked by a small but powerful hydraulic engine, which is started at will by the performer, and hand power is supplied should necessity require. The casing of the keyboard is finished and polished to the highest point of excellence. The work as a whole is deserving of all the praise that can be given, both artistic and technical execution and skill remain a lasting evidence of Mr. Mason's generosity and the skill and proficiency in their profession of Messrs. Fincham and Hobday. The name of Mr. George Fincham, the senior member of the firm which has carried out the construction of the new organ so satisfactorily, is now a household word in musical circles in the colonies. Mr. Fincham arrived in Melbourne in 1852, and started the profession of an organ builder in 1862, from which time up to the present he has had an unbroken line of successes, having secured nine first-prize medals for excellence in the art to which he is so zealous a devotee. Mr. Fincham has not allowed himself to entirely neglect public affairs, and last year he was created a justice of the peace, in recognition of public services rendered. Mr. Hobday, who is also an enthusiast in his profession, joined Mr. Fincham in partnership in 1881, and was entrusted with the establishment of a branch of the business in Adelaide, where he distinguished himself by securing the first prize medal at the recent Adelaide Jubilee Exhibition. Mr. Hobday returned to the Melbourne factory about four years ago, and with the combination of skill and excellent business qualifications of the partners, it is not to be wondered at that Messrs. Fincham and Hobday are so popular individually, and that their reputation as organ builders stands so high.